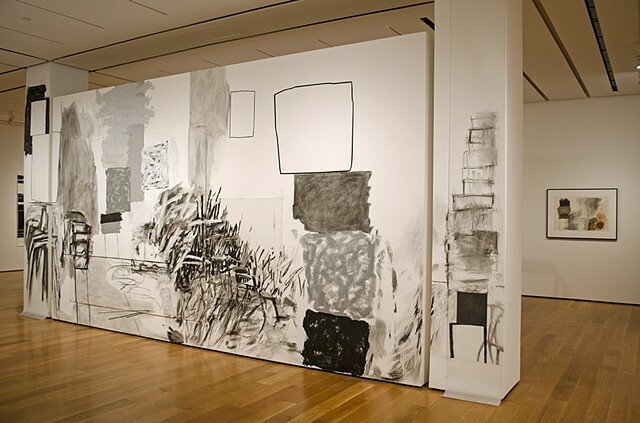 A wall drawing commissioned by the High Museum of Art, Atlanta, GA, part of the 'Inside the Perimeter' drawing exhibition. Curated by Michael Rooks, the Modern and Contemporary Art Curator at the High Museum of Art. The two flanking columns are 12' x 2', the central wall is 10' x 17' 6". The framed, small drawing that is seen to the right side of the 'wall drawing' is also a drawing by Rocio Rodriguez in the High Museum of Art collection.